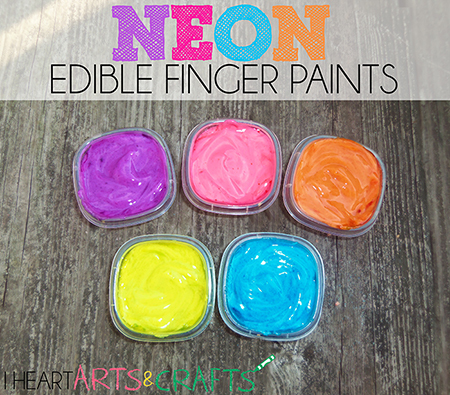 How pretty are these neon finger paints? My kids had so much fun color mixing and drawing with these. The taste safe neon paints are perfect for babies and toddlers, who still like to sneak those little fingers in their mouth. We had our two year old and seven month old playing with these, I’m always trying to find activities that I can include both of them in. The best part is how simple this is to make, they only contain two ingredients that you may already have in your kitchen! 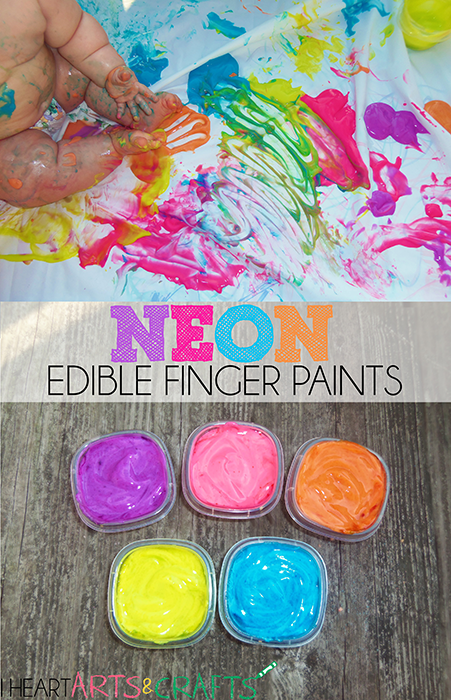 Mix the yogurt and a drop or two of the food coloring together to create your finger paints! Because the colors are so vibrant we only needed to add two drops to our yogurt mixture. 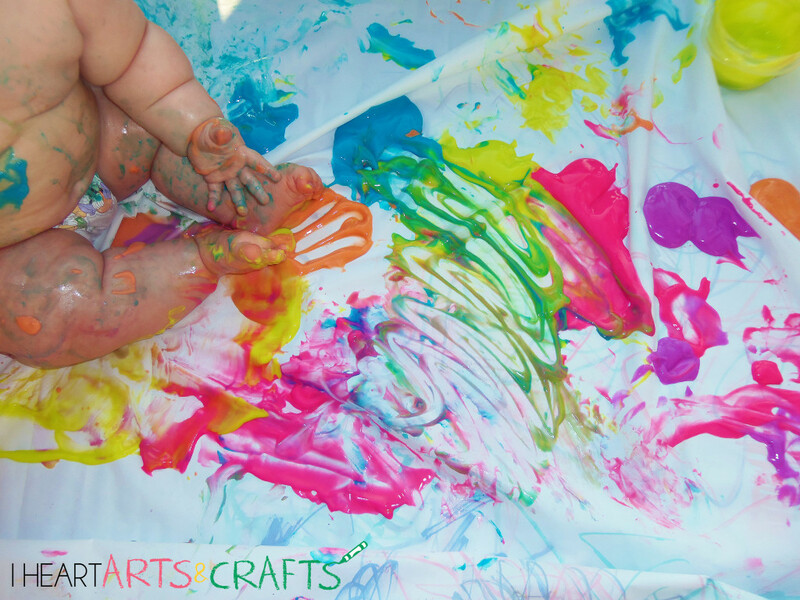 To make this sensory activity less messy I used a shower curtain liner as their blank canvas so that when we were done it was easy clean up! This is a great activity to do if you’re looking to introduce finger painting to your child for the first time. Our daughter loved playing with the paint in between her fingers and making imprints with her fingers in the paint. Because this paint is made from food items it is not meant to be stored or any of the artwork to be saved. This is more of a fun sensory activity that you can easily make in a few seconds, let the kids play, and throw away when they’re done (we prefer to do this on a shower liner as mentioned above for easy clean up)! Did their skin retain color? Every time I do one of these colored painting activities(any colored activity not just yours) their hands or anything the paint touches turns their skin that color. I never had a problem with any color staining with this activity. I had it happen with a shaving cream paint mixture that I tried from Pinterest so I haven’t tried any shaving cream paints after that! But this yogurt mixture wiped right off for us. Wow! That’s pretty cool and I would have never guessed that it is greek yogurt! that is so clever! – the kind of thing only a mmom can think up! I did not think to start finger painting yet with my 10 month old, but I guess he would already like it! What a great idea for a fun project! Thanks for sharing! Who would have thought that Greek yogurt could make an edible finger paint with such lovely shades of color??? Great activity for little kids! I can’t believe all you need is two ingredients!! What an adorable painter!! great idea! Saving for a rainy day. hahaha what a cute picture.. this would have been great when my kids were eating paint! This is so fun. I am going to make some for my daughter. I LOVE the picture too. Adorable. Love that it’s “edible”, I just hope it doesn’t give parents a false sense of security! Your baby looks like he’s enjoyin it a lot! oh, how fun! my little guy will love this! I wish they would have had this when my kids were younger. Would have saved a lot on clothes. how fun! We used to let my son “paint” with pudding. this would work great! Great idea! And that photo is too cute…love it! How cool! I would have loved to do that when my kids were little. We used finger paint and the mess was nuts. I love the idea of using yogurt and a shower liner. looks like fun. Thanks for linking up at Tell Me About It Tuesday. We hope you hop over and share with us again next week. 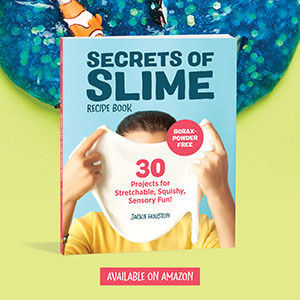 Since Food Coloring Is Used, Will It Stain The Child’s Skin? No, my kids were not stained at all from the finger paints. What kind of food colors did you use? Neon Food Coloring by McCormick, I bought it at Wal-Mart. I used this with the kids I nanny and they’re loving it! 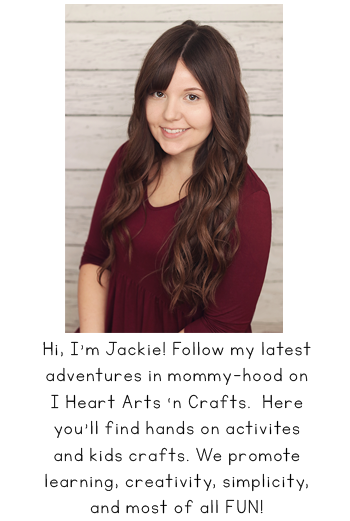 I was wondering if I could add a link to this page to my blog? I love this idea! And even though you can’t save the artwork, you can take pictures of the process, and that’s even better!